On a bright October 7th 1978 25042 blasts away from Abergavenney with the 12:22 Crewe - Cardiff. Unless otherwise noted all text and photographs are courtesy Peter Lovell. In the mid 1970s the North and West route from Newport to Crewe was in the doldrums. The route was originally developed by the LNWR and GWR as a joint line for traffic between Bristol and the South West, and South Wales to Manchester, Liverpool and the North West. The joint atmosphere was maintained after nationalisation the WR having sheds at Shrewsbury and Crewe (Gresty Lane) while LM locos regularly worked to Pontypool Road. The Crewe services normally started from the most northerly platform at Cardiff that was not ideal for photography. On May 8th 1981 25060 waits under the canopy with the 15:10 to Crewe. On Monday May 4th 1981 25245 passes the summit of the southern section of the route at Llanvihangel with the 11:50 Cardiff - Crewe. The route began at Maindee Junction a mile east of Newport (Gwent), where the triangular junction on the South Wales mainline provided direct access from Cardiff and South Wales on the west side, and Severn Tunnel Junction and Bristol on the east side. The first part of the line was the 42 mile section to Hereford skirting the eastern side of the black Mountains. After initially following the River Usk the first climb commenced just after Caerleon with 7 miles at about 1 in 100 to Pontypool Road. From here the line generally descended at similar gradients for another seven miles to Penpergwm where another seven mile climb to the summit at Llanvihangel began, initially at about 1 in 150, steepening for the final four miles after Abergavenny to 1 in 82 and 1 in 95. Once over the summit at Llanvihangel the line descended at about 1 in 150 for seven miles then levelling a little before the final descent into Hereford. 25224 passes the closed station at St Devereux on a showery May 4th 1981. This shot highlights the limitations of the slow colour film available in the 1980s, although I have managed to get the front of the locomotive in focus by panning the camera the remainder is slightly blurred. On May 5th 1981 25224 heads south from Hereford with the 07:54 Crewe – Cardiff. The area in front of the train had formerly been carriage sidings. After Hereford the line continued through the attractive small towns of the Welsh Marches for the 51 miles to Shrewsbury. The first 38 miles from Hereford to Church Stretton were virtually all uphill. The gradients were generally slight at first, but after Craven Arms the final seven miles were at about 1 in 120. From Church Stretton the final 13 miles to Shrewsbury were all downhill; fine if northbound but a slog for heavy southbound trains with spells at 1 in 90 and 1 in 100. With Shrewsbury Prison forming a backdrop 25042 gets under way again with the 12:20 Crewe – Cardiff on December 3rd 1977. With the steam heat boiler working 25047 arrives at Shrewsbury with the 11:50 Cardiff – Crewe on December 3rd 1977. The majority of the Class 25's covering the passenger diagrams were allocated to Crewe Depot, 25047 might be considered an interloper as it was at the time allocated to Springs Branch. After Shrewsbury came the 33 mile section to Crewe across the Cheshire Plain. Even here there were some steady climbs, the line descending from Whitchurch to Nantwich for 8 miles with gradients as steep as 1 in 97. Until the early 1960s trains such as the Penzance – Liverpool saw Newton Abbot and Shrewsbury crews working GW Castles between these location on double home turns. The early 1960s also saw GW Kings occasionally working the Cardiff expresses. Diesels arrived in the summer of 1962 when WR warships began working through to Crewe. In the summer of 1964 LM Brush Type 4s took over, handing over to WR hydraulics at Newport or Bristol. During the 1960s TPOs and sleepers were also conveyed on the expresses. A full range of local passenger, parcels and freight was also conveyed. Most of the original station buildings survived into the 1980s, but Ludlow was an exception with ‘bus shelter’ replacements. 25221 arrives at Ludlow with the 10:00 Crewe – Cardiff on May 7th 1981. With passengers sat on the platform there appears to be a relaxed atmosphere at Hereford on May 8th 1981 as 25060 waits to depart with the 15:10 Cardiff - Crewe. The Beeching Era saw many of the wayside stations close with Hereford in particular losing a lot of local traffic. The real blow came at the end of the 1960s when all inter-regional expresses were transferred to run via Birmingham New St. These were replaced by six Cardiff – Crewe trains in each direction. One of the southbound services ran overnight, departing from Crewe at 01:45. These services were formed of Cross-Country DMUs, some initially operating with mini buffets. With up to 16 intermediate stops the 139 miles took between three and a quarter and three and a half hours. Summer Saturdays still saw expresses when four South West holiday trains used the route in each direction, two of the southbound trains running overnight. By the late 1970s this had fallen back to two trains in each direction as holiday traffic declined. 25221 approaches Tram Inn on May 6th 1981 with the 16:02 Crewe - Cardiff. The allocation history of 25221 reveals a well travelled locomotive, at the time of this photograph its time at Crewe was drawing to a close, during August 1981 it transferred to Longsight. Things began to look up towards the end of 1976 when the Western Region started to replace some of their DMU services with locomotive hauled stock. Class 31s took over the Cardiff – Portsmouth services, while from November 22nd 1976 the Cardiff – Crewe services were Class 25s with six Mk1s. On Mondays to Saturdays there were three diagrams each covering two return trips. On Sundays there were just two trains in each direction requiring two locomotives each performing a round trip. 25245 waits to leave Hereford with the 16:02 Crewe – Cardiff on May 2nd 1981. 25220 accelerates out of Hereford with the 17:10 Cardiff – Crewe on May 2nd 1981. The Class 47 on the following Hereford – Paddington has been very quick off the mark in running in to the platform. The diagrams are set out below, the train times tending to alter by a few minutes with each new timetable. On the wet Sunday afternoon of May 3rd 1981 25042 & 25220 head south near Eye, Leominster with the 13:45 Crewe – Cardiff. A day trip to Cardiff on May 8th 1981 produced 25224 on the 07:54 Crewe – Cardiff, shown here arriving at Hereford. The diagrammed locomotives were Crewe based, with steam heat boilers in the winter months. Inevitably members of the class found their way onto these services. The most detailed records are available on the BR Class 25 Locomotive Passenger Working website (www.class25.info/index.htm). This records over 800 workings between 1976 and 1986 with 117 different members of the class. 25220 heads past the loop at Moreton-on-Lugg with the 07:54 Crewe – Cardiff on May 7th 1981. 25245 approaches Wellington Crossing, north of Hereford with the 17:10 Cardiff – Crewe on May 8th 1981. My personal experience of these workings was mainly when I lived in Exeter and cheap tickets were introduced on Saturdays during the winter months to fill up the inter-regional and Waterloo trains. Each week one of four different groups of destinations was available, one group included Crewe. The day would start on the 06:25 Plymouth – Liverpool (depart Exeter 07:30) that arrived at Crewe in time for the 12:25 departure. Crewe to Exeter via Hereford and Newport was still considered a legitimate route and we would catch the 12:25 to Nantwich or Shrewsbury for a three hour lunch in the pub. Suitably refreshed we would continue to Newport on the 16:00 Crewe, rattling down through the Welsh Marches in the twilight, with the steam heating hissing gently away. At Newport we would catch an HST to Bristol Parkway or Temple Meads for the final leg home the 21:20 Bristol – Plymouth. This was normally a Laira class 46 and consisted of about four coaches and a number of parcels vans. Lengthy station stops were allowed although there was little traffic on a Saturday evening before arriving back in Exeter at about 23:20. In May 1981 when my wife was expecting our first child I suggested that we should have a quiet week in Hereford. This provided an opportunity to get some final photographs before the Class 33s took over. On January 7th 1978 25222 heads away from Nantwich with the 12:22 Crewe – Cardiff. After photographing an ex-works class 40 on the Crewe Works test train in the opposite direction it was three hours in the pub before continuing with 25055 on the 16:00 Crewe – Cardiff. 40188 approaches Wellington Crossing on May 8th 1981 with a northbound air-braked service. In addition to working the Cardiff – Crewe’s the Class 25s also took a share of the freight traffic along with Classes 40, 46, 47 that operated over the route at this time. (My recollection is that Class 37s rarely worked beyond Hereford until the mid 1980s). A regular Class 25 turn during the 1970s was the afternoon Manchester – Bristol/Cardiff parcels, although from about 1980 this was normally a Class 47/4. 46056 waits in the middle road at Hereford with the 08:00 Carlisle – Severn Tunnel Junction for 25224 to pass with the 16:02 Crewe – Cardiff on May 5th 1981. 47539 approaches Wellington Crossing on May 8th 1981 with the 15:19 Manchester – Cardiff parcels. The demise of the Class 25s on this route started in 1981 with the arrival of 33031 at Crewe for crew training. BR policy was to replace steam with electric heating and remove the need for second men. 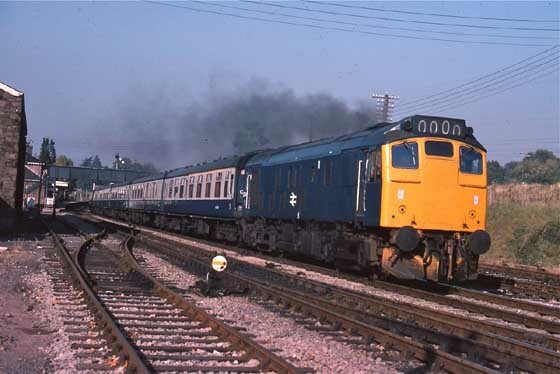 The Portsmouth – Cardiff’s had already gone over to eth fitted class 31/4s although they had a tendency to overheat. By 1981 the introduction of HSTs on the Western Region was making Class 50s surplus, and from May they replaced the Class 33s on the Exeter – Waterloo route. The additional power of the Class 50s produced an acceleration in point to point timings, but not reliability. By 1984 the Class 33s were in charge and on a sunny May 5th 1984 33006 races towards Wellington Crossing with the 13:25 Crewe – Cardiff. At Crewe the Cardiff trains tended to use the bay platform that was not designed with photographic composition in mind. 33014 waits with a Cardiff train on the morning of May 8th 1984. By 1981 the Class 33s were 20 years old with a strong reputation for reliability. Compared to other BR diesels they had led quite an insular life, rarely straying beyond 100 miles of their home depots (Exeter was 114 miles from Eastleigh). From June 1981 three day cyclic diagrams were introduced for Eastleigh allocated locomotives. Starting initially on Portsmouth –Bristol- Cardiff services they would also take in workings from Bristol to Plymouth, Cardiff – Swansea –West Wales and Cardiff – Crewe. Whilst on the Cardiff – Crewe workings they occasionally worked through to Manchester and also had a regular diagram to Bangor returning with a Bangor – Cardiff working. On April 3rd 1984 33037 waits to depart from Newport with the 09:10 Portsmouth – Cardiff. 47435 had just headed north with the 11:40 Cardiff – Crewe. The 10.03 Crewe - Cardiff waits for time at Newport with 33040 on April 3rd 1984. On May 11th 1984 47228 passes the remains of Dorrington with the 15:10 Manchester – Bristol parcels. The Class 33s operated on the Cardiff - Crewe route until September 1986, during their final year the diagrams included turns to Holyhead and Llandudno Junction. However, the Class 25s continued to deputise covering for Class 33 failures and unavailability. Further details are on the BR Class 25 Locomotive Passenger Working website. For further information on Class 33s on the North & West route see Class 33s in the North West website (www.timewarp.abelgratis.com/ch/ps33nw.html). By 1988 many of the trains were extended to North Wales, Manchester or Liverpool, however the authorities did not seem to think it justified any improvement in rolling stock. On December 28th 1988 37430 draws into Cardiff Station with a motley selection of stock forming the 13:23 Cardiff – Liverpool. During April and May 1987 celebrity 40122 was often based at Crewe for railtours and used on the morning 05:14 Holyhead – Cardiff returning with the 13:00 Cardiff – Crewe. On May 28th 1987 40122 crosses the River Usk on the approach to Maindee Junction. The travelling enthusiasts are positioning themselves in the front coach for the climb to Llanvihangel. After the demise of the Class 33s in 1986 the Cardiff – Crewe services continued to be locomotive hauled by Class 37/4s and Class 47s until Class 156 DMUs arrived in about 1990. Some of the most interesting workings occurred in May 1987 when for a few weeks BR’s last class 40 40122 often worked the 05:14 Holyhead – Cardiff returning on the 13:00 Cardiff - Crewe . Today (January 2012) the North & West route is operated by Arriva Wales with at least an hourly service from Manchester or North Wales using Class 170 units. A daily loco hauled service, sponsored by the Welsh Assembly, operates from Holyhead to Cardiff hauled (at the time of writing- January 2012) by a class 57/3. Locomotive-hauled on the Cardiff – Crewe route 2010 style. Class 57/3 57316 pulls away from Crewe with the 16:15 Cardiff – Holyhead on April 14th 2010.